The absolute highlight of our trip to Austria was a visit to the Eisriesenwelt (world of the ice giants) which is the largest glacial cave in the world. It has been at the top of our to do list ever since we began a trip to these parts and it still managed to exceed our very high expectations. In short, this is one of the most astonishing places I have ever seen! 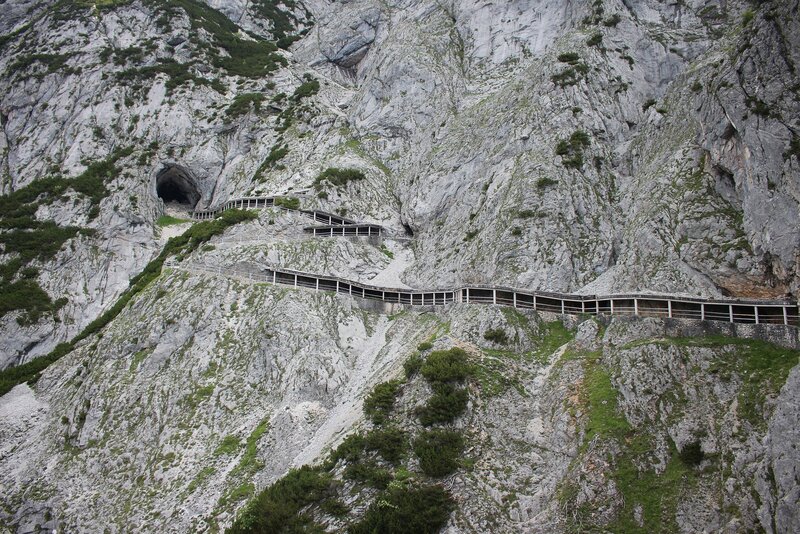 The ice caves are located just outside Werfen, accessed through a massive cave located at an altitude of 1641m on the slopes of the Hochkogel in the Tennen mountain range. The total length of the system so far explored is 42 kilometres but only the first kilometre contains ice. 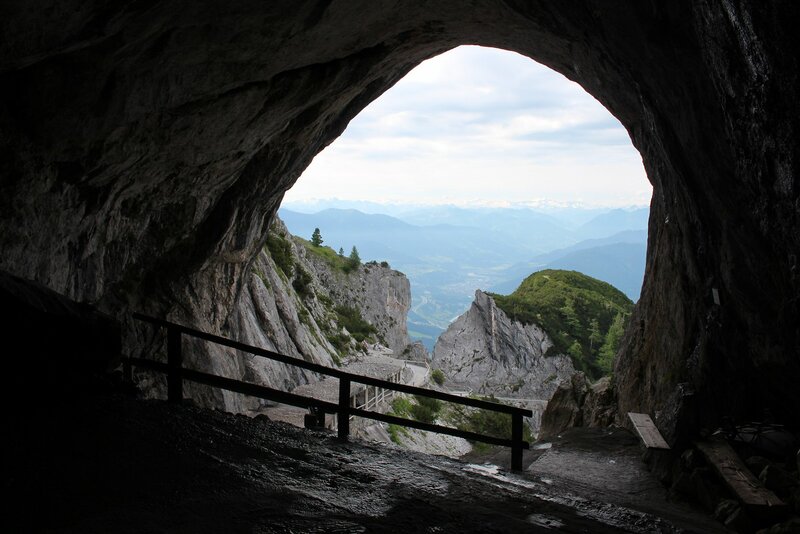 The cave was first discovered in 1879 by Anton von Posselt-Czorich but interest really only picked up when it was re-discovered by young cave explorer Alexander von Mörk in 1912. Alexander made it as far as an impassable wall of ice but would never get the opportunity to see the full extent of the caves, dying on the Eastern Front on 23 October 1914. On 28 June 1925 the urn containing his ashes was placed in a niche in one of the largest cavities in the system in fulfillment of his wishes. We are very privileged to have such an easy route to explore the cave. The earliest tourists had a much harder trek up the mountain and had to camp overnight before tackling the cave itself. The tour we can now do in 70 minutes would have taken 7 hours back then (with considerably greater difficulty!). However, it would be worth it under any conditions – the vast swathe of ice that greets as you enter the Posselt Hall is jaw dropping but this is only the first of many wonders, each more stunning than the last! The ice in the caves is changing all the time, with the ice ten metres thicker in places than when the discoverers first saw it (you can also see the layers of ice a bit like you can tell the age of a tree through its rings). The wind is forever re-shaping the ice, as you can visibly see from the ice walls. An elephant shaped sculpture has now been whittled away by the wind to such an extent that it now looks more like a shark! To ensure a good flow of visitors around the caves photography is sensibly not permitted, but you can get a good impression of the interior through the gallery on the eisriesenwelt website. It has to be said that these pictures, as stunning as they are, do not do the place justice. It is quite something else to be standing on the steps and see the vast expanse of ice surrounding you inside these caves (and in the case of the ice tunnel quite literally all the way around you). 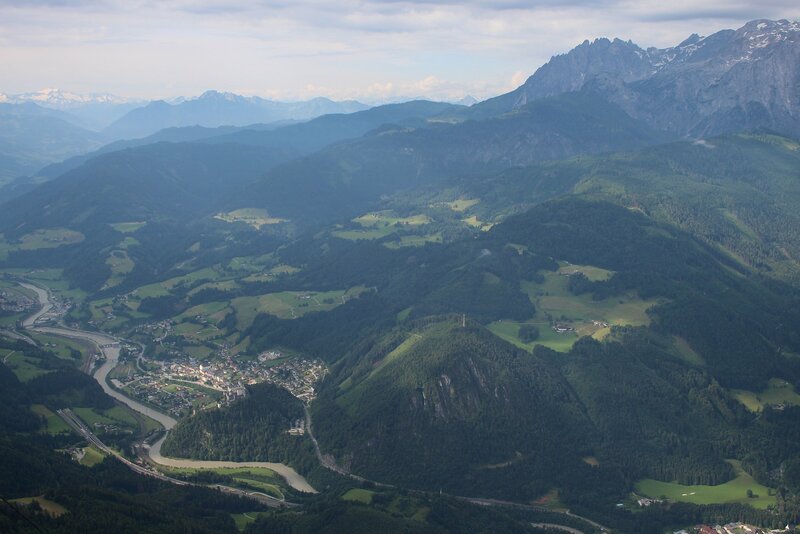 The other major attraction in the area is the impressive Hohenwerfen Fortress which is easily combined with a visit to the ice caves. 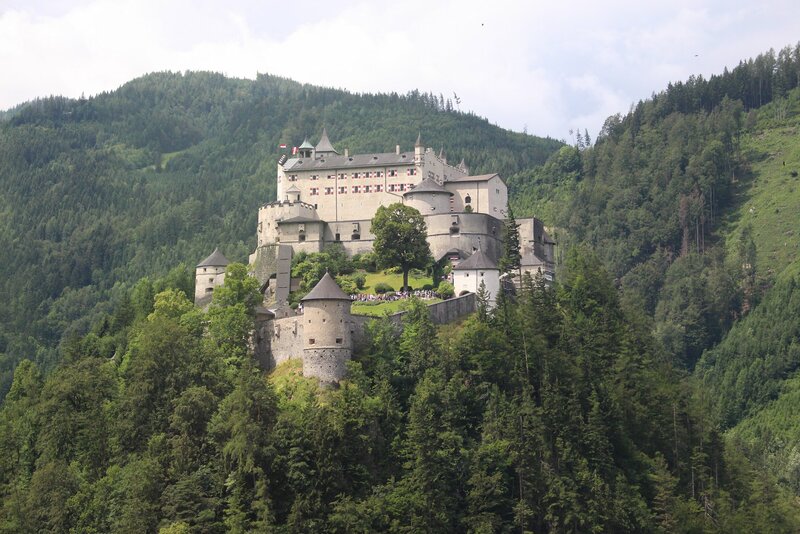 It is a castle that can trace its origins back to 1070 with a varied history that has seen it used as a judicial centre, prison, royal residence, Nazi training facility, school and now a tourist attraction. We caught the 7.21am S-Bahn train from Salzburg Hbf to Werfen, connecting perfectly with the first Eisriesenwelt shuttle bus of the day at 8.18am. 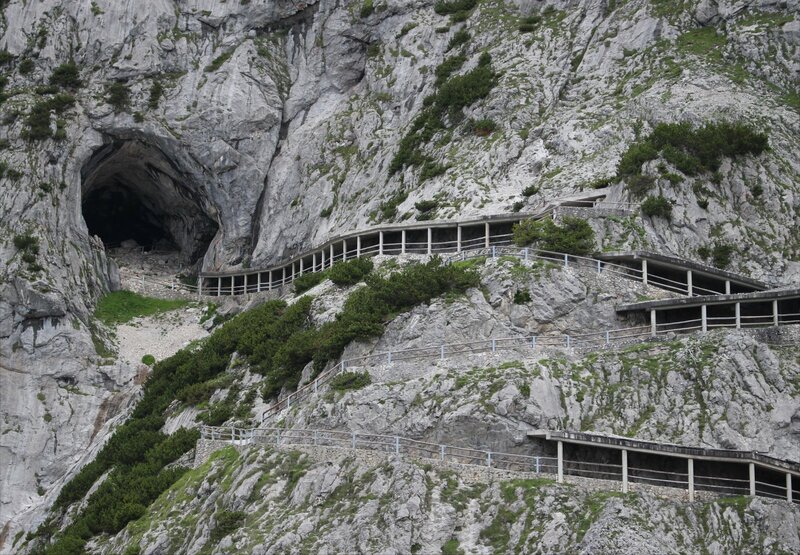 The shuttle bus links the station and nearby car park with the ticket office for the cave system (a 5km drive at a maximum incline of 21% which takes around 20 minutes). It’s a pretty well organised system and we noted that the driver had popped in to the station to check up on the train that the shuttle bus is timed to meet. 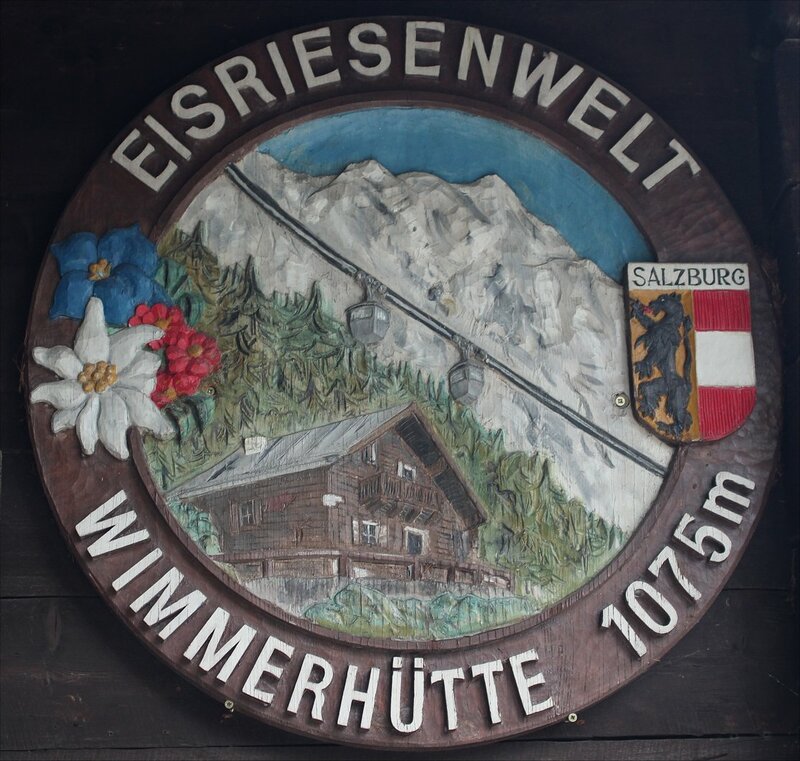 Once you have bought your tickets you have the choice of two routes to the lower cable car station near the Wimmer Hütte. 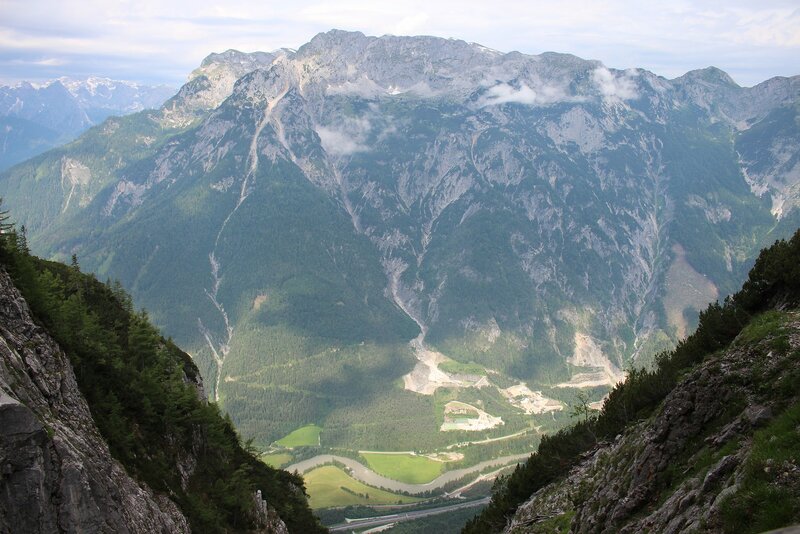 As it wasn’t the best of days we decided against the panoramic way and took the tunnel shortcut, boarding a cable car just before 9am for the three minute ride up to the upper cable car station (1575m). 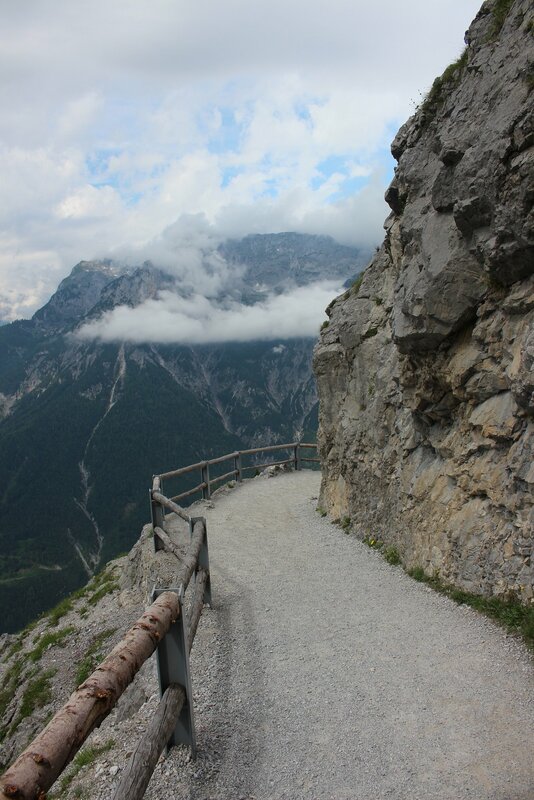 From this point it was a 20 minute walk to the top with stunning views of the mountains and the pathway up to the cave hole. My fear of heights was pretty active here! Arrivals at the cave mouth are split between english and german speaking tour groups (we were assigned to an english speaking tour setting off at 9.30am). As there is no lighting in the cave carbide lamps are handed out to each pair of visitors, though the guides will also light magnesium strips inside the cave to provide additional illumination. It’s an incredibly impressive tour, but does involve a bit of exercise – some visitors had found the strength to reach the cave mouth but abandoned not long after starting the tour (something that happens every day according to the guides we spoke to). The first surprise is the sheer force of the wind as you enter the cave system. Our guide warned us to keep a hold of of hats, scarves and glasses as he opened the heavy metal door and he was spot on. It was as if a gale force wind had been concentrated on a single doorway. Apparently, this is all to do with the meeting of cold air from the cave with warmer air from outside and on a hot summer’s day (unlike today) the wind can be as strong as 90km/h! 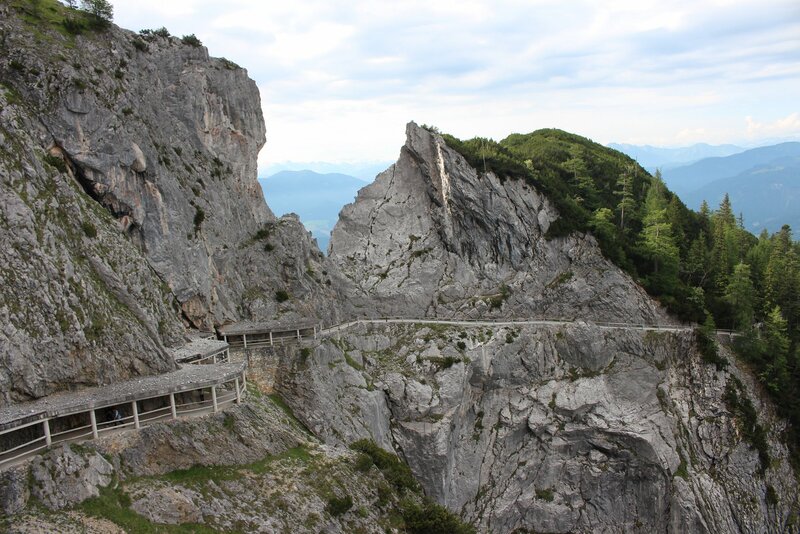 The tour takes you up 700 steps and the same back down, with a difference of 134m in altitude between the entrance and the ice gate (1775m). In everyday terms, that is the equivalent of climbing a 40 storey building so it’s not to be underestimated, but it is so worth the effort! If I had one recommendation to make, it would be to bring some gloves. The low temperature of the cave did not bother me as you are always on the move but my hands certainly felt the icy cold of the handrails. After catching the 11.23am shuttle bus back down to the car park in Werfen we took the path that runs parallel to the railway towards the castle. It is possible to take a winding pathway up to the castle from here, but having expended plenty of energy already we took the lazy option and followed the signposts that direct you along the hard shoulder of a busy road to the castle car park. From here you can take a funicular into the heart of the castle. 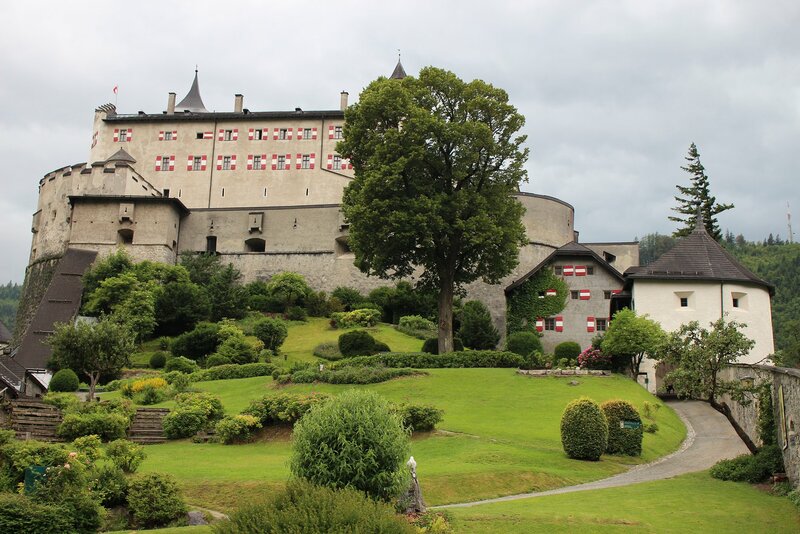 Your ticket allows you to enter the castle interior by guided tour (we followed a German language tour with an audio guide), gets you access into three museums and the chance to watch a falconry show. 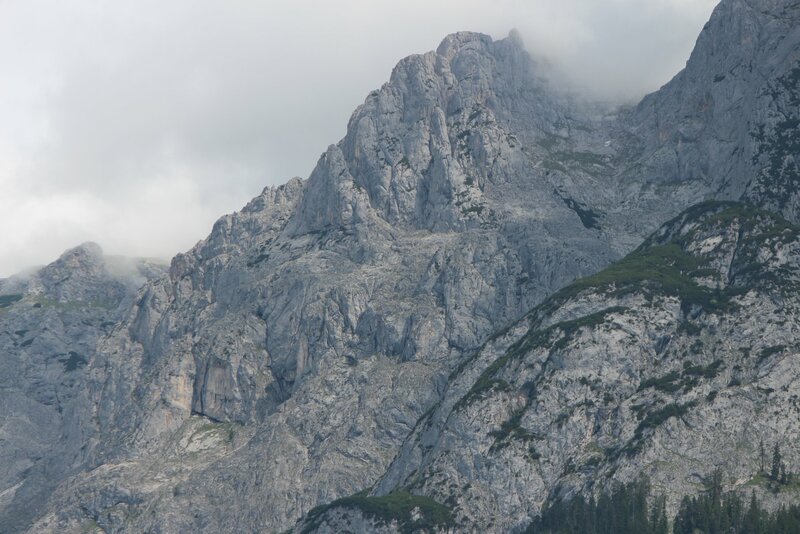 It made for a pleasant bolt on to our day and it is certainly a visual treat (some of the best views were from the eisriesenelt shuttle bus). The combined experience is not cheap. 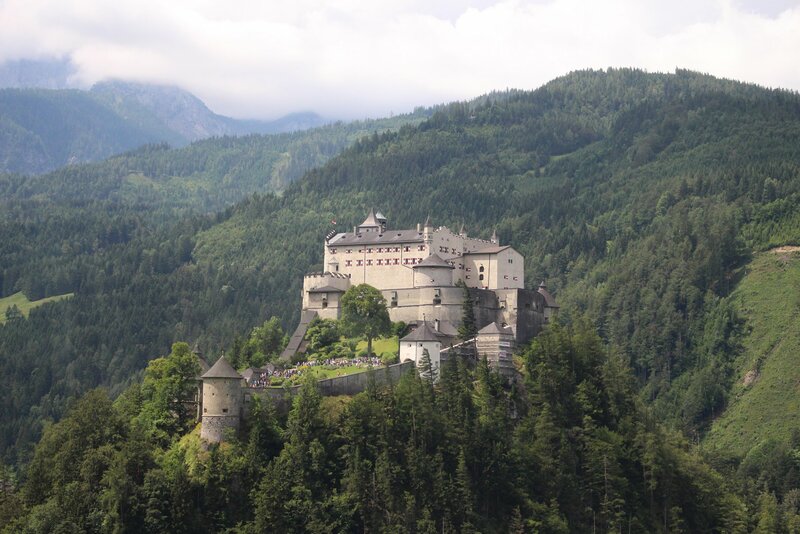 The cost per person came to 63,70 euros (17,20 euros for a return ticket by train from Salzburg, 7 euros for a return ticket on the shuttle bus, 24 euros for the cable car plus cave tour and 15,50 euros for admission to the castle and the lift up+down).